Rajasthan is the magical land of flavours, where there is always condiment to spice up your life. Tender Tandoori lamb piecces marinated in pickled spices, cooked in a sweet and sour sauce blended together with onions, peppers, garlic and ginger. 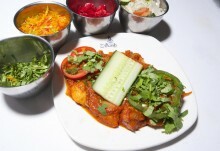 This dish has all the flavours anyone could need in a curry dish - absolutely delicious! Click the button below to add the Lamb Rajastani to your wish list.